I've seen finished pictures like this before, but never quite knew how it was done. But a special birthday present was needed and so I thought it was time to give it a go. I bought a permanent marker with a 1mm tip for the drawing, although Miss 3 pressed so hard with it, I could have chosen one with an even finer tip. I used some good quality heavy paper, cut it to size, and drew the border on. 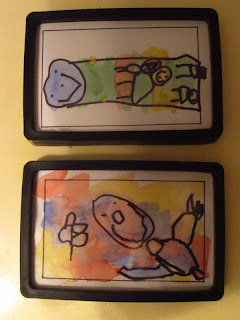 Then I gave the kids instructions to draw inside the border, and then to paint every bit of white inside the border. For the paint I used watered down water colours. I could have perhaps made them less watery and achieved brighter colours. It was important to teach the kids to wipe the excess water out of the brush. I did want the colours to run together a little, but not with whole puddles on the paper. Initially I tried to keep it to just primary colours (used for the bottom picture) but Mr 4 badly wanted green for the top picture. I asked Miss 3 to draw her picture in lead pencil first (to make sure it was an interesting picture from an adult's perspective, not just a big scribble), and I had planned on drawing over her lines with the pen myself. Of course, being a very independent crafter, she ended up doing the pen herself. So in retrospect it probably would have been better to skip the pencil step. 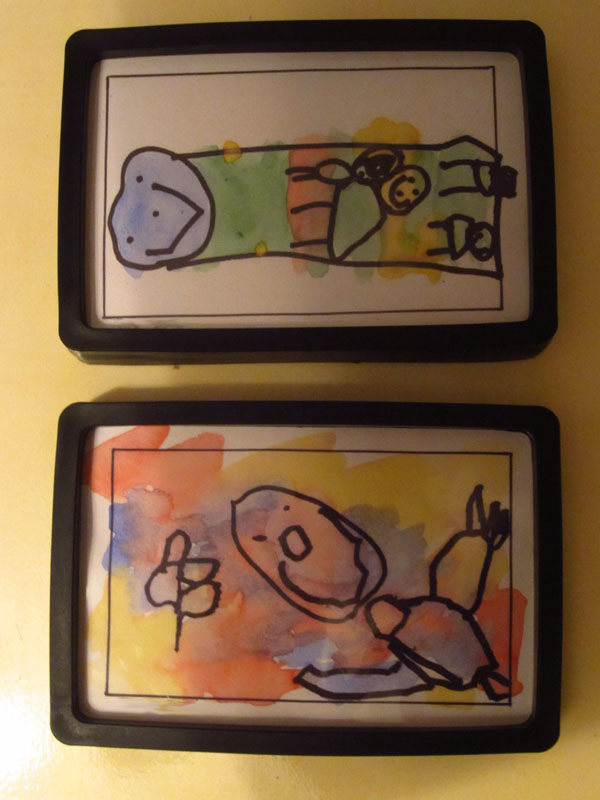 Mr 4 wasn't in an arty mood and took a bit of convincing to get going, so I didn't push the point when he decided to only paint over his drawing rather than everything inside the border. Instead I let that be his artistic choice.